CULTURE: Shared patterns of behavior, interaction and achievement… developing specific characteristics and knowledge toward a stated goal. Blueprints are available for building and maintaining successful football programs. Alabama is the current gold standard, and has been for nearly decade. Just how did the Tide pull off a culture makeover down south? It has been said that imitation is the sincerest form of flattery. So, let’s emulate them! Let’s discuss the building blocks Oregon Football needs in order to reach the pinnacle, as Alabama has. 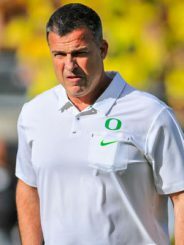 Coach Mario Cristobal is building a strong culture at Oregon. Run a clean program on the field. Play a much cleaner game by minimizing penalties and mental mistakes. This is becoming a reliable barometer by which to measure progress. Teach players to live clean lives, and yes, be role models of the university they represent. Student-athletes need the desire to be educated, as well as to be productive players and citizens. Role models in Tuscaloosa they are! A smile, a handshake, an autograph a kind word or deed goes a long way to show class to the community and represent the program. It can be done well here, too. Recruit skilled, class athletes to be the best team players and championship caliber guys. Character kids and those who seek to obtain this value are usually the best culture fits. Demonstrate “we’ve got your back” principles — most desired by coaches, teammates and fans. It is trust! Employ a head coach with honest values. This may be the most vital element for culture success in any program. We all know HCs without a moral compass who have great W-L records. Everyone in a program is likely to follow the example shown by the head guy — for better or worse. Build and maintain great facilities to showcase to recruits, as well as to develop athletes within and promote our image nationwide. Nurture numerous, loyal, dedicated, fans. There is no place for louts, drunks and foul-mouthed followers. These people reflect any program poorly and diminish the image of class and culture desired. Great fans with class are needed, and in abundance. Retain administration and support staff who possess vision, integrity, and innovation. Herbert was dynamite in his season debut. Showcase a Poster Boy. We had Marcus Mariota as the face of the program with his Heisman. 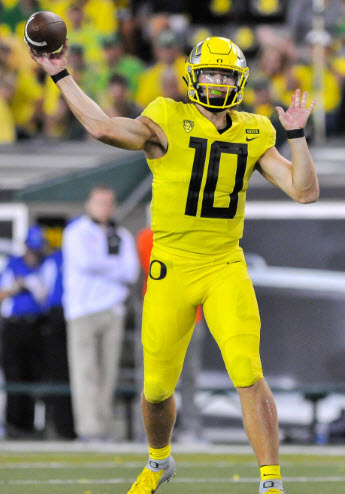 Now that new face should be Justin Herbert, and/or Troy Dye – both promoted, front and center. Encourage athletes as mentors, teaching and exhibiting the culture personified to new recruits and players. Earn capital and use it judiciously. Invest time and more time, to implement the change process. It would seem several years are required to turn the culture in the desired direction, based upon programs of prominence. Keep a moral compass, conducting all business the right and honorable way (this has the makings of another entire editorial). Balance the risks and rewards of a change from the old established methods to a new paradigm shift. Some simply will not buy in and be gone! Practice discipline among coaches and players, and hold them accountable for doing things the right way. This greatly reduces mental mistakes, increasing capabilities. Appreciate cheerleaders and marching bands, who add value and are essential to promote our style and panache. Our motorcycle entrance is tradition, not unlike dotting the I in Columbus. Practice great communication skills, both verbal and non-verbal. Win football games. Of course, winning enhances and builds any culture so much faster. Everybody loves a winner. Wins define a successful process of culture buy-in. Build a brand. 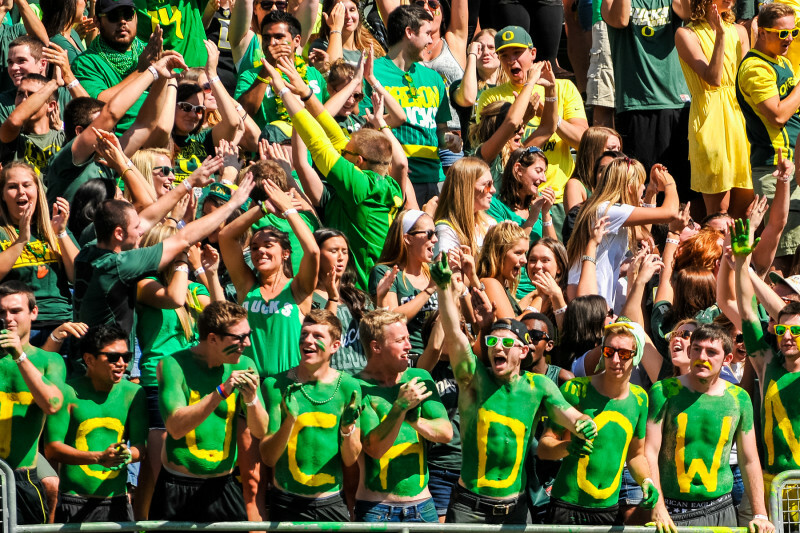 A recognizable name makes culture easy to spot and promote at Oregon and across the country. What do we desire our football program’s identity to be? Big, physical, fast and skilled? Yep. Provide a safe environment. Safety is absolutely critical to bring about change and move people to another level of commitment. Succeed in talent evaluation and adaptability, both physically and mentally. It is a learned cultural evolution. Embrace fun and enthusiasm. For fans, this is self-fulfilling, easing the path to successful program culture — and it is contagious. Incorporating the above elements together will define, in large part, the culture destination we desire in Oregon’s climb to prominence. It took Chris Petersen three years to build a championship-caliber team. Petersen recruits “His kind of guy” — aggressive, clever, quick and strong athletes. He implements programs, of systems and advisers, teaching life skills off the field to help athletes to be productive in society when they’re done with football. His players know he is invested in their lives on the field and post-football! David Shaw rarely gets 5-star guys, but emphasizes strength and intelligence on and off the gridiron. Shaw’s teams hardly ever beat themselves and will maul you in the trenches. 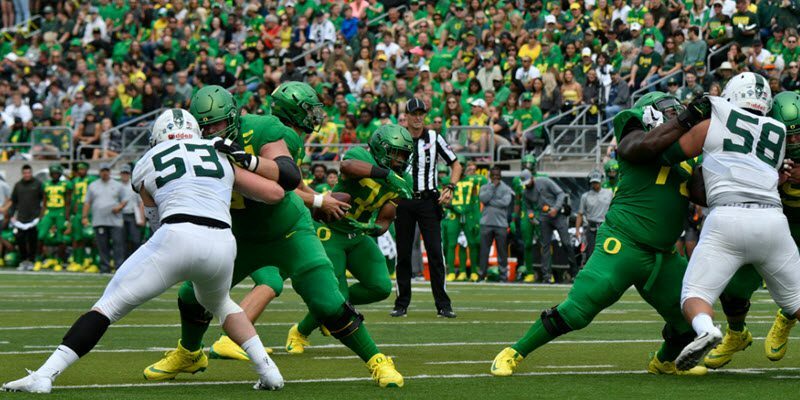 Witness last Saturday’s heartbreaking loss to the Tree at Autzen, as they capitalized on Oregon’s mistakes to pull out a win. Mike Leach thinks outside the box, by attacking via the air first. Though he is a terrific evaluator of players and coaches, has he ever had a 5-star recruit? Whoever is his QB is merely plug and play! Leach is a marvelous salesman for his scheme and system (Oregon and Ohio State recently took four terrific coaches from his staff and Leach hardly skipped a beat with a continued nine-win seasons, in Pullman no less). Will Oregon get there sooner rather than later? Patience is a virtue, but is a rarity in college athletics. We are going to need plenty of patience as we watch Oregon achieve its lofty goals of excellence. There is a great chance this culture change will happen right here in Eugene, and the Ducks will continue to make us proud!